The artist from Holland Karel Fabricius was one of the most talented students of Rembrandt van Rijn. Fabricius paid special attention to the transfer of lighting, as well as the contours of objects on canvas. He did this very technically, applying cold colors on a textured background with light backlighting. Karel was a kind of experimenter, often turning to complex effects and perspective with an emphasis. So, while working on the “Goldfinch” canvas (the correct name is “Goldfinch”), he first applied the impasto technique. The picture shows an expressive brush stroke made with a rich paint brush. The painting “Goldfinch” became the artist’s swan song. It was written in 1654 (the year of the death of Fabricius) with an inscript in the lower right corner “C. FABRITIVS 1654 “. This little masterpiece is kept in the Royal Gallery of the Mauritshuis (The Hague). Its dimensions are 33.5 X 22.8 cm, the execution technique is oil on wood. The background of the painting is very airy, the master applied the effect of natural sunlight, which indicates the plein-air nature of the color scheme. Shcheglion harmoniously combines photographic accuracy and blurriness. Thus, the outlines of the perch are very clear, but the image of a little bird is a little blurry. This technique is used very skillfully, because the viewer thinks that the chick is about to flutter with its wings, flutter and fly out into an invisible window, from where light and freshness of air is shed on the picture. The bird looks so real that you want to reach out and touch it. The elegant simplicity of the picture simply fascinates. 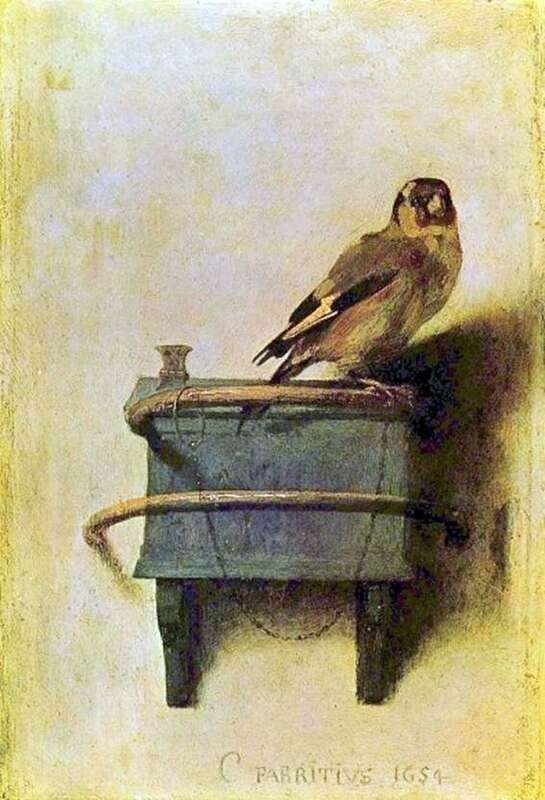 In the “Goldfinch” painting, Fabritius made some elements of the composition transparent in order to make them natural (for example, the wings of a dandy). Many admirers of his work are confident that such a manner of a master-genius shows the true skill of the artist.